Sigma 35mm f1.4 DG HSM A Sony mount lens review: Ultra high performance? For most enthusiasts, whether they like the field of view of a 35mm lens or not, this model will need little or no introduction. In both Canon and Nikon mount versions, it has consistently garnered praise for its build and image quality, not just from us but from just about everyone that has had the opportunity to use one. The optical construction consists of 13 elements arranged in 11 groups with two aspherical lenses and four SLD (low dispersion) elements. However, there’s one further element using FLD anomalous dispersion glass, that’s similar to the performance of fluorite. The lens also adopts a complex ‘floating’ element design for improved quality at close range and focuses to 30cm. With a filter size of 67mm, a length of 94mm, a sizable 77mm maximum diameter, and weighing 665g, it’s big and heavy lens. All the same, at $899, it undercuts the rival offerings from the big brand names, while few come close to matching its image quality. 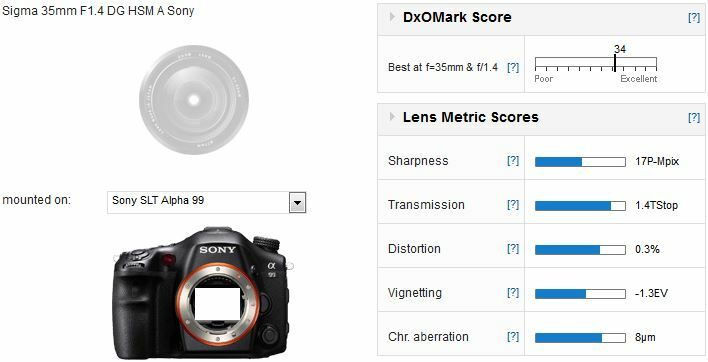 With a truly excellent overall DxOMark lens score of 34 points, the Sigma lens shows that it’s capable of replicating the high image quality associated with this optical design using a Sony mount. With a very 17P-Mpix Sharpness score, it’s one of the sharpest lenses available for the A99, and has terrific resolution in the center at full aperture. Sitting in the top-slot, the Sigma 35mm f1.4 is the best performing model on the Sony A99 in our database, and one of the sharpest lenses available for Sony users. Distortion is very mild and chromatic aberration, while fractionally higher than that seen on the Nikon mount, is still very well controlled. Vignetting is expected on high-speed lenses like this, but while it’s quite strong at full-aperture (varying from -1/3 EV at 50% of the image field to -1.3EV in the corners) it’s less than competing offerings. Revamped six years ago, the Sony 35mm f1.4 equivalent is based on an earlier, film era Minolta design. Although the firm introduced the lens with little fan-fare, it’s thought, besides the revising of the exterior, Sony updated the glass to lead-free types and improved lens coatings. Against the brand new Sigma the aging design of the Sony reflects in the scores. 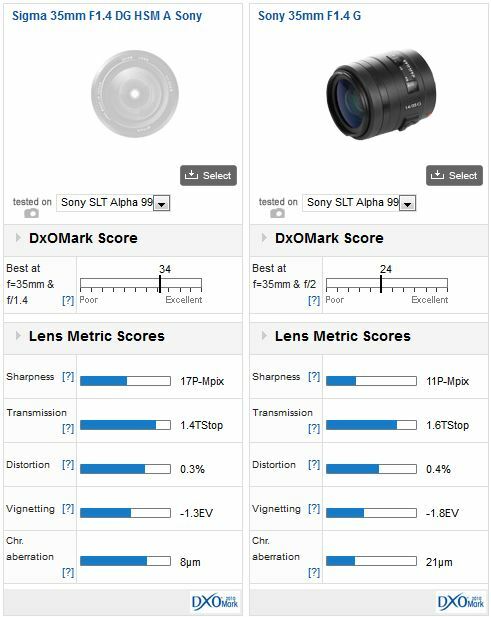 Overall, the Sigma achieves an outstanding DxOMark score and a very high score for Sharpness; 17P-Mpix vs. 11-P-Mpix for the Sony. Not only that, but the Sigma is a 1/3 Stop faster in Transmission, has +1/2 stop less vignetting at full-aperture and has superior control of chromatic aberration with digital sensors. 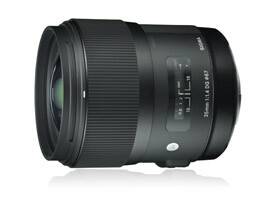 And, as an extra incentive, the Sigma is far better value at $899, against a hefty $1,499 for the Sony. If you’re looking for the very best ultra-high speed 35mm for a Sony Alpha A99, or A900/850 for that matter, the choice is rather limited. However, thanks to Sigma making their extraordinary 35mm f1.4 HSM Art series lens available with a Sony A-mount there’s now reasonably accessibly priced option with the optical performance that rivals can’t seem to match. Sigma’s thrown down the gauntlet; it’s now over to the marques to respond.